I live with a bunch of messy people. Not just physically messy, although at 18 my older daughter still leaves a colorful trail in her wake. But messy in the sense that they challenge me. They’re different from me. They perpetually call me out of my comfort zone into growth. I adore these messy people of mine and wouldn’t want to change them one bit. Sharing life with other human beings is not for the faint of heart. Even before our kids arrived, as my husband and I mixed together our different personalities, cultural backgrounds, and languages, and then stirred in individual strengths and struggle; when we sprinkled in our fears and dreams and expectations of life and marriage, the result often felt a little more Pollack than Rembrandt. But this glorious mess we’ve handcrafted together is an amazing piece of art all the same. Before we go any further, I need to confess something: my name is Krista and I am a recovering perfectionist. I like control. I prefer order and calm and everything in its place. I adore lists and budgets and guidelines to make me feel safe. But a lifetime of attempting to color in the lines, to measure up and keep up, to make other people follow in my predictable footsteps was not as fun as I thought it would be. And the delightful, unexpected, fabulous news is that these messy people of mine have taught me, lesson by lesson, to loosen my grip, laugh heartily, and open up to joyful possibility. They’ve taught me to make peace with messy. I like messy people — folks who don’t color in the lines; who march to the beat of their own drum and live like they mean it. People who are not afraid to be unapologetically themselves and walk with courage and confidence. These are the type of people I want to raise. This is the type of person I am becoming. Even as I worked diligently to teach my kids to read and bake chocolate chip cookies and drive a car – they taught me to listen. They taught me to breathe and surrender and have some fun. My rule-abiding firstborn taught me to relax. He taught me to loosen my grip on needing things done my way – to see beyond my imperfection and actively scan for my strength. To see how perfectionism and fear kept me bound and help him do the same. My creative and competitive first daughter taught me to create and make space for adventure. She helped me learn to laugh at myself and to see that we’re all gifted, differently. She challenges me still to see from a new point of view and to have the courage to just be me. And when I held my sweet and sensitive third baby in my arms I decided once and for all, to love myself. For her sake and mine, I realized that I would never again abuse my body or speak negatively about myself. She taught me that my words matter and to use them wisely, with intention. These messy people I’ve been privileged to grow up with have taught me how to love myself and how to really live. If you want to find your way over to freedom and joy then embrace the truth that we are all messy people. So what should you do when you live with messy people? 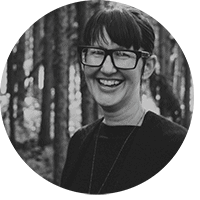 Krista is a stubborn questioner, honest storyteller, and Joyful Living Educator. Her mission is to help women live unshackled lives of purpose, health & JOY. If you’re ready to show up fully to your imperfect but beautiful life, she’d like to offer you 30 Days to Greater CALM. In Krista’s words: “Sometimes what we need is time to rest and regroup. Time to get honest about what is and is not working in our current lives. A chance to actually decide who and how we want to be for the next season of life… and maybe permission to begin taking self-care seriously.